The Thespian is a Series 8 Minifigure released in 2012. The Thespian is the only Series 8 minifigure with a double sided head. His bio mentions the Studios theme. LEGO.com accidentally titled this minifigure "Actor", while his bio text called him by his official name, "The Thespian." The same designer designed The Thespian's hairpiece more than 20 years before he designed The ruffle piece. The ruffle was designed for him, but has since been used on the Sad Clown. The Thespian uses his quote "To build or not to build" when Shakespeare stated "To be or not to be". The Thespian also resembles Shakespeare. The Thespian carries a minifigure skull in reference to the above quote. 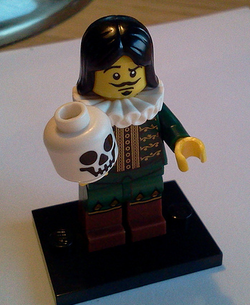 William Shakespeare's appearance from The LEGO Movie is similar to this minifigure, but in red and has different hairpiece. The Thespian is a master actor, able to slip into any role you can imagine. He plays every part to perfection, from Romeo to Juliet (the lead actress was ill, and the show must go on, after all…), and receives a rousing standing ovation after each and every performance. He’s really good at celebrity impersonations, too. The Thespian started his career as a minor background player on the old LEGO Studios set, but since those days his fame has really taken off. He constantly gets offers to appear in big-budget movies and television shows, but he always declares that heart will forever belong to the stage. Of course, as much as he enjoys acting, he does occasionally confess that what he’d really like to do is direct!